No, it wasn’t an April Fools’ joke. On Friday, April 1, 2016, I was able to visit the set of Law & Order: SVU as a result of a Kickstarter and a dear friend. More specifically, Warren Leight, the showrunner since season 13 donated a visit to set as part of a Kickstarter for the 20th anniversary of the 24 Hour Plays. 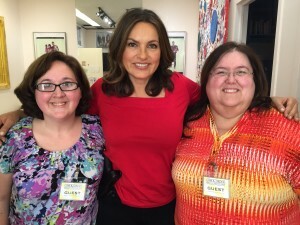 A dear friend backed the Kickstarter when it ran in the fall of 2015 and come April 1, 2016, we were on the set of SVU, a show we have both watched for most of its existence (albeit some of it in USA marathon catch ups). Note: I will be able to share a little more once the episode that we watched film airs in May. After a quick intro to the show via its production office we were off on a mini tour of the set, which included the hallway outside the courthouse (the last remaining artifact from the Mothership set! ), the bullpen, Interrogation Two, the DA’s conference room, and a multi purpose room most often used as the show’s Rikers’ set. It was last seen in Season 17, Episode 15 “Collateral Damages”. Later during the visit we also saw additional pieces of set, including the morgue, the hospital and a flexible space that can be customized to each episode’s needs. I think my favorite parts of the set were the details of the bullpen – including the elevator doors and precinct map and the plaques to a number of people. Some of the plaques were for SVU characters and some that appeared to be regular members of NYPD. There is a lot of attention to detail on the set. We also learned that the court room and some parts of the DA’s office are shot on location at the 60 Centre Street building where they frequently shoot. It was on the tour where we got our first glimpse of the actors filming that day as Bobby Burke (IAB Captain Ed Tucker) passed us while we were looking at the Rikers’ set. From the bullpen we were able to have a peak at Mariska Hargitay (Olivia Benson), Kelli Giddish (Amanda Rollins), Peter Scanavino (Carisi, aka New Guy) and Ice T (Fin Tutuola) rehearsing a scene that we later watched tape from Video Village. As someone who doesn’t watch much TV, it was amazing to see how many angles are required to get the scene exactly as the writers and director want it. I also found it interesting to see how many different ways they can cue one another. We watched most of the scenes we saw filmed from “video village” where the writers and many of the other behind the scenes staff of SVU watch the filming through two monitors. Through headsets at our seats we were able to listen to the actors as they spoke. Due to the proximity between video village & the areas of set where they were filming on Friday, we were able to observe a lot of interaction between the writers, director, actors and other show staff as they fine tuned scenes and lines while filming. The collaborative process is amazing and I learned how un final even a “final” draft of the script can be. By the visit’s end, we’d seen four scenes filmed and I really look forward to seeing the episode air to see which of the takes stick. A quick 30 second scene takes a lot of work to film. Among the most interesting things I learned was how the final Tuckson scene in Unholiest Alliance came to be through the various takes and how it ultimately was set in the hands of the editors. While in video village we met two of the show’s writers, Rob Cohen & Brianna Yellen as well as Amanda Slater. We also got some fun show trivia from the PA who guided us around during the day. We also had a quick opportunity to meet Warren Leight when he came into the room to discuss a few items. I definitely came away with the understanding that a television show set is a true whirlwind. Besides quickly seeing Bobby Burke during the set tour, the first actor interaction was with Ice T when he came out of a scene being filmed in Benson’s office. He spoke with us for a few moments – and seemed genuinely welcoming. I was also taken by how relatively short he was. Later in the day we were also introduced to Kelli Giddish when she came into video village. Surprisingly, and not, the two actors with whom we were able to spend the most time were Mariska Hargitay and Bobby Burke. Both were fantastic to speak with and learn from. 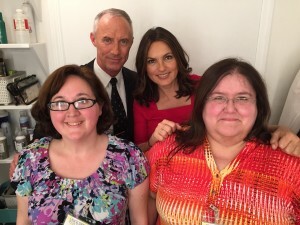 It was actually Mariska who wanted us to have the chance to speak with Bobby and she brought him into video village to meet us. While I don’t think I’ll ever ship Tuckson, I really learned a lot about the two actors’ thoughts about the characters’ relationship (in general, and in the season 17 sense). I also learned a fair amount about what Bobby & the writers see in Ed Tucker and his character’s evolution over the time he has been on SVU. While this is easy to say as I don’t watch much TV, I can’t honestly think of an actor who is less like his character than Bobby Burke is. He’s the polar opposite of pre season 15 Ed Tucker and was a pleasure to spend time with. Mariska was every bit the beacon of light that she comes off as in interviews and that I’ve read about in other fan interactions. I treasured every moment we spent with her and bizarrely? Didn’t feel as star struck as I feared I might. The non SVU highlight of our conversations? Talking theater. It was among the first topics that came up when she asked my friend what else we were doing while she was in town. Alas Hamilton wasn’t on the week’s agenda, but pre-ordering Hamiltome was. I was also floored that she remembered my name to make further introductions amid remembering lines for the scenes they were filming. While I love Olivia Benson, I admire Mariska more for the work she has done with Joyful Heart, No More and others. Amazing advocate. It was interesting to discuss scenes from past episodes with the writers and the actors. There were things they were aware of and recommended that we weren’t. Both Bobby Burke & Mariska gave us the “homework” of watching Amaro’s 180, a season 15 episode. It was a homework assignment I thoroughly enjoyed. And there were things that we’d noticed that weren’t top of mind for them-an interesting and enlightening discussion. Due mostly to Bobby Burke being on set, we found ourselves discussing Perverted, the season 11 episode in which Benson is framed for murder and Tucker perp walked her out. It served as an interesting contrast to the current Tucker as well as to how Tucker treated Nick in Amaro’s 180, which is why that came to be homework. Both actors wanted us to see & understand Tuckson. While I’m 99.9% sure that will never be my ship, I walked away with a new understanding of it and as I promised when Mariska asked, I remain open minded about it. As I mentioned briefly when Unholiest Alliance aired, I’m still glad Tucker wasn’t found to be dirty. I feel even more strongly about that now that I had the chance to meet Bobby Burke – he’s a wonderful gentleman and I think he & the writers are going to develop Tucker in interesting ways. As someone who wandered away from SVU before Chris Meloni left and caught up when falling back in love with the show a few seasons ago, I don’t feel the 1.0/2.0 distinction as strongly as some do. I miss Stabler but can enjoy the current show as solid story lines and interesting characters. With all the subsequent cast changes, it’s almost as if they’re two different shows with only Benson as the link. I do sometimes think of the newer seasons as a spinoff. Stabler may be gone from SVU, the character and the actor were a topic of frequent conversation during our visit as Meloni’s episode of Inside the Actors Studio had aired the night before we visited set. There were SVU components to his interview that aired as well as the portions that Bravo put online. [For a great write-up of the full taping, here is @bones_booth’s post.] Between the recent selfies as well as the photo post for his birthday, it’s safe to say that Chris isn’t far from Mariska’s mind. I doubt that Elliot is far from Benson’s either. I wish I’d thought to ask her where she thought Stabler was now as that’s not a topic I’ve seen covered in any interviews. So many questions I found myself wishing I’d asked. It was a wonderful afternoon but of course not long enough. Visiting a TV set wasn’t anything I ever thought I’d see myself doing but when this opportunity presented itself, I knew there was no question. It was educational in learning how a TV show “works” but also wonderful to meet the actors, writers and others that make the show go behind the scenes. Here’s to another 17 years of a wonderful show. Sure. We actually asked both (M first, who then brought Bobby in to talk further about it) about how they saw the current state of the relationship having evolved from their history. Specifically in Perverted when Olivia was framed for murder and Tucker perp walked her out. Interestingly, Bobby remembered that but Mariska didn’t. I thought it was interesting though that he’d trust Amaro, a cop he hadn’t known anywhere near as long as Benson, to surrender himself but needed to perp walk Benson out. BTW, guessing from a scan down your twitter that you’re caught up. If not, end of second paragraph has a spoiler from Manhattan Transfer. That’s where the “homework” to watch Amaro’s 180 came from because both suggested that we watch that to see the start of “new” Tucker. I quite enjoyed that episode but didn’t see the changing as much as I did in the episode later in that season where Tucker tried to help Benson from falling on her sword with the Lewis grand jury. He’s gone from wanting to humiliate her to being in a relationship. (My personal note, I know they’re only officially sleeping together per the conversation with Barba near the end of Manhattan Transfer, but I don’t see this as just that. I can understand their attraction to one another, and both actors (and I think Rob, but not 100% on that) cited some similarities to Stabler as a factor. I just am not sure on how they got to the point of actually liking one another. I’m hoping that more Tucker background (writers said they’re looking to more story lines that help incorporate IAB/Tucker to help tell it) that shows their evolution to a point of respect. I also want more back story on Tucker as I find him a fascinating, complicated character. I’m mostly indifferent to Tuckson and not quite sure I see it working, but promised both I’d keep an open mind. There’s more I can say on that after this episode airs. I’ll try to remember to tell you – if not, ping me. Let me know if this did or didn’t answer.